The Aggies (19-10, 11-1 WAC) won their ninth straight and wrapped up the regular season title with two games remaining, while the ‘Lopes (16-12, 7-4 WAC) had their four-win streak come to an end. Playing in front of a raucous home crowd of 7,005, Grand Canyon got off to a quick start, building a 16-6 lead seven minutes into the contest. Then the Aggies answered with a 24-4 run over the next 10 minutes and the ‘Lopes could never get back. The Aggies used a stifling defense for most of the game, building a 20-point lead with four minutes to go before down shifting for the win. NM State held GCU to 40 percent shooting from the floor (19-of-47), while limiting the ‘Lopes to 31 percent (4-of-13) from the 3-point arc. Offensively the Aggies shot 55 percent from the floor (27-of-49) and placed four players in double-figures, led by senior Remi Barry with 18 points to go with seven rebounds. Senior Daniel Mullings chipped in 16 points with five assists, two blocks and two steals. Pascal Siakam tallied 13 points with a game high eight boards, with Ian Baker adding 10 points and five steals. Senior Tshilidzi Nephawe added nine points in the contest, becoming the 32nd player in NM State history to score 1,000 points with a free throw in the first half. Grand Canyon was led by senior Royce Woolridge who collected a game-high 20 points, while junior DeWayne Russell tallied 10 points with five assists. The Aggies dominated the glass, grabbing 34 rebounds to GCU’s 19. NM State won its second WAC regular season title under Menzies, but it was the first outright WAC regular season for the Aggies. In fact, NM State had not claimed an outright conference regular season championship since winning the 1993-94 Big West Conference title. NM State also won the BWC Tournament that season. The regular season title guaranteed a post-season berth for the Aggies, but they have their sights set on the WAC Tournament Championship in Las Vegas in March. NM State has won the tournament and the NCAA automatic bid the last three seasons and four times in the last five years. NM State is off until next Saturday when the Aggies travel to south Texas to face Texas-Pan American. They Aggies have a final home game on March 7, when they face Chicago State for Pack the Pan Am Night. 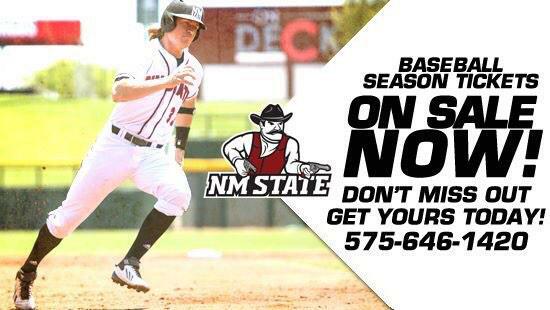 NM State will honor its seniors and welcome the new class of the US Bank/New Mexico State Athletics Hall of Fame.